The Training of over 150 Water committee members across the 6 Sub Counties has come to an end. The Committee members were taken through their roles in regard to Procurement, management of Water projects, supervision, finance and record keeping. The Department of Lands, Environment, Natural Resources and Climate Change will play the monitoring, evaluation and supervision role through the Sub County water officers. Matters on audit, Environment, Conservation and protection of water sources will also be taken into consideration by the officers. Speaking while closing the training at Kabiyet hall in Mosop Sub County, CECM LENRCC Mr. Baliach urged the community to fully own the projects for posterity. “The County Government wants the community to have a feel of devolution by making them own the projects and ensure the projects become operational and sustainable. Let us maximize the funds given for the projects. Labour based approach is the preferred way of implementing the projects” he said. Among the Committee members who attended the training were from Koria, Kakiptui, Ndulele, Ngariet/Kabruce water projects. A total of 66 Water projects across the Sub County will be done this financial year. 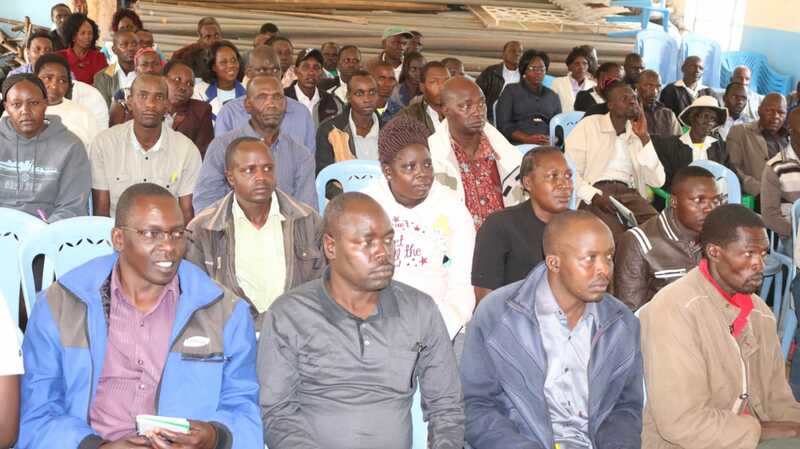 Present during the trainings were Sub County Water officers, Procurement, Legal, Finance and Environment officers.